The suspension spring is a simple component that vastly improves vehicle handling, braking and ride quality. Most springs are made from steel that has been heat treated to increase its rigidity. The most common types are the leaf spring and coil spring, followed by the torsion bar and air spring. Damaged springs that have lose some of their strength should be replaced as soon as possible. The main role of the suspension spring is to keep the wheels in contact with the road. 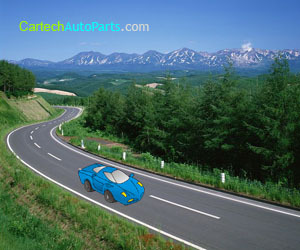 Car handling suffers badly when there is not enough friction between the tire and road surface. Faulty suspension is a common cause of car accidents, especially when traveling around corners. The friction force provided by the tires must be greater than the centrifugal force, otherwise the car will slide off the road. Lack of friction also causes the drive wheels to spin, wearing out the tread in the process. The other role of suspension is to improve the ride of the car, by smoothing out the vertical movement of the tires as they ride over changes in the road surface. Without a suspension spring on each wheel, these jolts are transferred directly to the car structure and the occupants, making traveling in the car very unpleasant. Shock absorbers are fitted alongside the springs to dissipate the energy stored in them and smooth out the ride even more. The leaf spring was the first widely used suspension spring. It is made from several long bars stacked on top of each other. The bars have the same rectangular cross-section and curvature but they get progressively shorter in the stack, with the longest bar at the top. The bars are held together with braces and are free to slide between the bars next to them. The ends of the top bar are curved and attached to the frame by pivot pins. Leaf springs are still widely used on trucks but they have been replaced by coil springs on most cars. The coil spring is the most common type of suspension spring. It is often called a helical spring because it is made from a steel rod that is formed into a helix before being heat treated. The ends are bent to form a flat surface so that the load is spread out over the top of the spring. Coil springs began to replace leaf springs on cars in the 1970s and they are now the most widely use spring on small vehicles. However, leaf springs are more suitable for large vehicles that carry heavy loads because they spread the load out over a wider area. Springs lose their strength when they become corroded or damaged, not just because they are old. This loss of strength results in significant changes to handling and ride performance. A visual sign that the springs needs to be replaced is a drop in the ride height when the car is empty. Springs can also fail if they have small cracks in them. These cracks grow larger over time as the spring moves until it finally snaps suddenly. This type of failure can be very dangerous, especially when the car is moving at high speed. Replacing a damaged spring is a difficult and potentially dangerous task. For coil springs, a compression tool can be used to reduce the length of the spring so that it fits between the axle and frame. The compression tool is basically a screw rod with two large hooks that pull the ends of the spring together when it is tightened. Another method used by mechanics is to lift the vehicle off the ground slightly, allowing the spring to be changed while the ground supports the wheel.